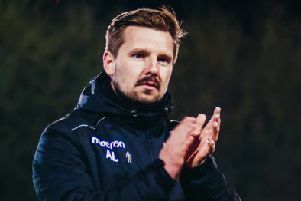 Guiseley made it seven games unbeaten In National League North after defeating Alfreton Town 1-0. This good run of form was extended thanks to a goal from Rowan Liburd. Before the game ex-Leeds United youngster Lewis Walters was confirmed as a new signing for Guiseley and he made his debut up front for the side. The Lions took the lead with just 10 minutes on the clock, when a short back-pass by Martin Riley was picked up by Liburd who took a touch, rounded the keeper and placed the ball into the empty net. Alfreton started to make an impact in this game when ex- FC Halifax Town forward Tom Denton saw his header well saved by Joe Green. While the hosts had chances, Guiseley were controlling the tempo of the game and nearly doubled their lead when Walters crossed to Liburd but Alfreton keeper Sam Ramsbottom made a fine save to keep it the effort out. Alex Ray-Harvey was making his first start of the season and impressed, with him almost making it 2-0 after a fine passing move found the midfielder who just didn’t get enough power on his effort. Harry Middleton was sent off, for a lunge on Kingsley James, the straight red saw Guiseley have a man and goal advantage and they saw the game out. Harrogate Town remain top of the National League, fighting back from a goal down to edge out Havant & Waterlooville at the CNG Stadium. Simon Weaver’s side began sloppily and just six minutes were on the clock when they found themselves behind. Visiting left-winger Josh Huggins nodded in-field for the unmarked Nicke Kabamba who drove towards the Harrogate box and picked out the bottom corner with a low strike. Town were, however, back on terms a little over five minutes later. Joe Leesley’s corner from the right was cleared, but Liam Agnew sent the ball straight back to the winger who curled a delightful cross into the area where Callum Howe rose highest and powered home a header. A fast start to the second period then saw the hosts take charge of proceedings. George Thomson’s 52nd-minute corner from the right sparked a scramble in the Havant six-yard box and the ball eventually fell for Dominic Knowles to force home at the back post. Five minutes later, Knowles danced past a Hawks defender and into the box before pulling back from the right towards the penalty spot where the waiting Jack Muldoon squeezed a shot through goalkeeper Ryan Young. Town gifted their visitors a way back into the contest when Lloyd Kerry lost possession inside his own box and the ball broke for Kabamba to lift delicately over James Belshaw, but Weaver’s men held on for a third win on the spin, extending their unbeaten start into a 10th game. FC Halifax Town are fifth in the National League after a 1-1 draw with promotion rivals Leyton Orient at the Shay. Bradford Park Avenue stayed third in National League North despite conceding five goals on the road for the first time since August 2016. Mark Bower’s men were beaten 5-3 at Chester, who secured only their second win of the season courtesy of Dan Mooney and Anthony Dudley braces, as well as a Craig Mahon effort. Replies from Ben McKenna, Jake Beesley and Oli Johnson had the visitors level early in the second half, but poor defensive play would prove Avenue’s downfall. Farsley Celtic eased past hosts Guisborough Town 4-0 in the FA Cup First Qualifying Round on Saturday, writes RICHARD BYRAM. A brace from former Leeds United youngster Nathan Turner (42 and 46) plus late efforts from Luke Parkin (83) – another ex-White – and Isaace Baldwin (90) made it a profitable trip for the visitors. Knaresborough Town recovered from the shock of falling behind in the second minute to Mark Buchan’s goal to thrash visiting Kendal Town 7-3 at The Manse. Rob Worrall (18) got the Town equaliser and three more goals followed quickly from Brad Walker (21), Nick Black (25) and Josh Garbutt (27). Brad Carroll (50) pulled one back for the Evo-Stik West Division outfit, before Greg Anderson (53) restored Knareborough’s three-goal advantage. Black (60) and Garbutt (63) added gloss for the NCE Premier side, before Buchan (75) bagged a late consolation for Town. Frickley Athletic won their eagerly-awaited South Yorkshire derby tie at Maltby Main 2-1 in front of 500 people. Tyler Walton’s 21st-minute penalty and a Rich Patterson effort (74) sent the Blues through to the next round. But fellow Evo-Stik East Tadcaster Albion went out after a 3-1 defeat at Bamber Bridge – who led 3-0 at the break – Joe Lumsden replying on the hour for the Brewers. Garforth Town lost 5-1 at South Shields and Whitby Town’s trip up the coast to Whitley Bay ended in a 1-0 defeat. Prolific striker James Walshaw’s equaliser earned Steve Kittrick’s Scarborough Athletic a 1-1 draw at Marine and the sides will replay tomorrow evening at Ashburn Road. In the Evo-Stik East Division, Brighouse Town are up to third after a 3-1 home win against Loughborough. Aaron Martin (29), Thomas Haigh (44) and Thomas Nicholson (47) on target for Town. Newly-promoted Pontefract Colleries continued their good start to the campaign with a 2-0 home success against Stocksbridge Park Steels. Michael Dunn (5) and Eli Hey (80) with the goals for Colls who are sixth in the table a point off the top three . Yorkshire Amateur missed out on the chance to go top of the Premier Division when a 90th-minute Ryan Basi goal earned Thackley a 2-2 draw at Bracken Edge, writes RICHARD BYRAM. With leaders Hemsworth MW losing 1-0 at home to Barton Town, Ammers would have gone top if they had managed to hold on. Brice Tiani (45) had given the hosts the lead, but James Ngoe (67) levelled. Matthew Dempsey (78) put Ammers back in front before Basi’s dramatic intervention. At the other end of the table, bottom side Harrogate Railway Athletic crashed 3-0 at home to improving Penistone Church, while fellow strugglers Goole went down 4-2 at home to Eccleshill United, despite taking a first-minute lead through Oliver Smith. Athersley Rec climbed off the bottom with a 2-1 win at Bridlington Town – Adam White (33) and Lee Garside (70) for the visitors, Terence Barwick (62) for Brid’. Liversedge slipped to sixth in the table after a 4-1 loss at Hall Road Rangers. Mitchell Hamilton (49) cancelled out Leon Smith’s 43rd-minute effort before three goals in the last seven minutes won it for Rangers. In Division 1, Nostell MW kept up the pressure on leaders Winterton Rangers – who won 8-1 at Rossington Main – with a 3-2 home win over Ollerton Town. Miners – in a rich seam of form this season – saw Joseph Thornton (2) and Adam Hayton find the net. Selby Town trailed 3-0 at half-time against visitors Hallam, before a late Sam Cable double restored some pride for the Robins, while three goals in five second-half minutes set up Glasshoughton Welfare’s 3-2 derby triumph over rivals AFC Emley. Worsbrough Bridge are third after a 2-1 success at Shirebrook Town, while Campion climbed to fifth with a 4-2 win at Swallownest.